A day of two halves! Game one against Clydesdale Western in the U18 Club Cup was lethargic – but game two was packed with belief, energy and effort. ❗A very well organised and disciplined Glasgow Western made it very difficult for the Fjordhus Reivers U18 girls to create anything going forward, which resulted in the Borders side remaining on the back foot for much of the game. Pinned back into the defensive thirds, there were glimpses of what Reivers were capable of when the ball was turned over in midfield and they were able to counter-attack, but there was not enough to really threaten the team in orange, who ran out 3-0 winners. After a one-game break and time to reflect, the girls came out full of determination and energy and it looked like a different team had taken to the pitch to play Inverleith U18 girls. A very well worked move by the Inverleith girls saw them go 1-0 up after 10 minutes. However, this seemed to be the catalyst for the big turnaround. It was Reivers’ turn to press the opposition, not allowing them to pick their passes and it was Reivers who frequently won the battle in midfield and defence, turning the ball over to create some great attacking play on the counter. Every player, playing to their potential, saw loads of creativity from back to front and it was midway through the first half, that a well worked corner, through Meghan Campbell, saw Sophie Laurie hit the post which was then ‘shelled’ into the goal by Molly Turnbull. 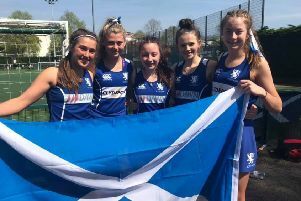 The Reivers girls took heart from this and, although Inverleith had a couple of great opportunities, they were thwarted by a disciplined and brave defence in Charlotte Fairburn, Ellen Keefe, Lily Towers, Caoimhe Minnikin and Danielle Walker. A fine break from Dani, who passed on to Chloe Aitchison who. in turn. slipped it to Molly Turnbull to slam it in. resulted in the second goal on the stroke of half time. The girls were not going to give up their lead and great leadership in centre midfield from Hannah Miller. ably assisted by Meghan Campbell, Amber Graham and Beth Logan. saw the girls continue to harass the opposition, not allowing them to pick their passes. Lindsay Jack, Chloe Aitchison and Molly Turnbull were tireless in their running up front, pressing hard and not letting the Inverleith back four get their heads up to find passes. Meanwhile, at the other end, Hollie Grieve and Christie Rout, in goal, were fearless in putting their bodies on the line to prevent Inverleith find the equaliser. A couple of corners in the dying seconds caused the coach, manager and supporters to hold their breath but the defensive corner team was not going to give up a goal easily and excellent, courageous running out by Charlotte Fairburn, and the rest of the defence, saw the girls win their final match 2-1, finishing their U18 Club Cup campaign in third place. It was a tremendous achievement for the Fjordhus Reivers U18 girls. Thankns were extended to Jane Aitchison for managing the team, to Emma Pate and David Johnston for umpiring, and to the loyal supporters. Results: Fjordhus Reivers 0, Watsonians 1; Fjordhus Reivers 2, Granite City 1; FjordusReivers 0, Clydesdale Western 3; Fjordhus Reivers 2, Inverleith 1.